Morgan Finlay started his music career very early and even sang in operas like The magic Flute. He also successfully participated in various contests. As a world traveler, he also performed and lived at many different places in Canada and Europe. 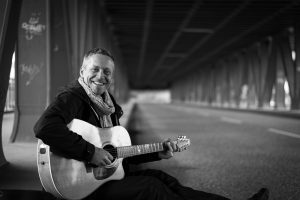 Morgan tours Germany regularly and even offers house concerts. 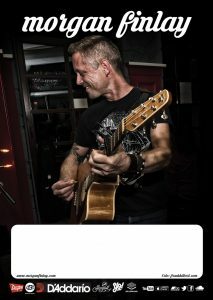 Here the very own German-Canadian impressions of one great Canadian musician and performer not to miss! You are originally from North Vancouver with Irish roots; you have been traveling a lot and have lived in various places like Montreal, Toronto, Ireland, Spain. What place do you call home these days? These days I live in Sevilla though I am intending to move north to Hamburg in early 2018. I spend most of my time in Germany. What do you miss the most from Canada when you are away? Mostly I miss my friends and my parents, but I also miss the rides on the BC Ferries over to the Island. In Vancouver I miss cycling the bike lanes, strolling Commercial Drive and punching my coffee card at the Bean Around The Worlds. I miss the long drives across BC, and the Tim Hortons breaks. What are your favourite places in Canada and why? I have a long-standing love for Montreal, but probably the place that is the closest to my heart is East Vancouver. I love being out among the Gulf Islands, and I am of course charmed by the Maritimes. Newfoundland was amazing and I’ll never forget it. What do you enjoy the most in/from Germany? I love so many things about Germany that it is hard to know where to start. I love how people say hi when they come into any restaurant or even into a store; I love how clean and organised things are. I love the long grassy fields and the beaches of the north. I love how everyone in German society is taken care of; I love the leading role that this country has taken globally when it comes to social welfare, to the environment, and to alternative solutions in general. I love the beer. What professional achievement are you most proud of so far? I am very proud of my fan base, that has come together and successfully crowdfunded my last three albums. I was very proud of having written ‘New Harbour’ in three weeks in Newfoundland. What is your favourite self written song and why? This is actually kind of, a question with no answer! I love each of my songs, for what they represent and when I work them through to the finish line, after hours or even weeks they are burned into me. I’m really proud of some of the songs that have been the most successful on the live stage; at the same time, I love some of the ‘dark horses’ that have appeared on my records and never made the stage. What are your ultimate professional goals? I want to make many more albums, and I hope to perform live for a long time more. I also want to do more with film, and make more use of my YouTube channel. If you could choose, which Canadian and also German artist would you like to work with and why? I have always thought about doing a duet with Sarah McLachlan… and I love playing with Mathew James White (NZ). As far as a Deutsch artist goes, I used to work with Anja Krabbe, and more recently I’ve been listening to Christina Lux and Robert Carl Blank. I’ve come across many talented and friendly German indie musicians over the years. What are your favourite places in Germany and why? Although I have forever left a piece of my heart in Berlin, I have a soft spot for many towns around the country. I can’t choose a favorite really, because they all represent something different in my touring life— I have unique relationships with each. One has a favorite coffee shop, another a favorite music store, another a close friend… If I had to list a few of them, I think I would start with Hamburg, Köln, Chemnitz, Freiburg, Düsseldorf, Regensburg, Hann Münden, Erlangen, and again Berlin. Who inspired you most as an artist, who did/do you idolize? As artists, I really respect Bruce Springsteen, Bruce Cockburn, John Lennon and John Mayer. As humans and innovators, I admire Elon Musk, Bill Gates and Barack Obama.